The commissioners of the Quezon City Film Development Commission: (Top row, L-R) executive director Professor Eduardo J. Lejano Jr., director Soxie Topacio, Dr. Mary Ruby M. Palma, MTRCB board member Milo Sogueco, NCAP’s Eduardo D. Sazon, and PMPPA’s Orly Ilacad. (Below, (L-R) Hon. Eufemio C. Lagumbay, Atty. Jesus Manuel Suntay, Vice Mayor Ma. Josefina G. Belmonte, MOWELFUND's Marichu Maceda and Ms. Rosario DL Yara. As a part of the campaign to legitimize the tag “City of Stars,” the Quezon City local government, through the Quezon City Film Development Commission (QCFDC), recently launched QCinema: 2012 Quezon City Film Festival. This newly established film fest will grant P800,000 pesos to three chosen screenplays as production fund. Since the goal of QCinema is develop and promote the art and craft of filmmaking among Quezon City citizens, there must be at least one bona fide resident of QC among the project’s major proponents (director, writer, and/or producer). Submission of entries is open until July 31, 2012. The 3 chosen films will be screened on the first week of December. 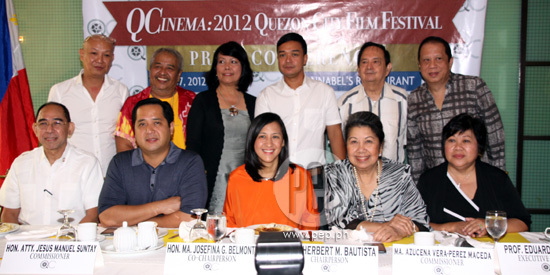 A press conference for QCinema was held recently at Annabel’s Restaurant in Tomas Morato, Quezon City. It was attended by QCFDC’s commissioners, including Quezon City Mayor Herbert Bautista and Vice Mayor Ma. Josefina G. Belmonte. Other commissioners present were executive director Eduardo Lejano Jr., Hon. Atty. Jesus Manuel Suntay, Hon. Eufemio Lagumbay, Dr. Mary Ruby Palma, Ms. Rosario DL. Yara, Movie and Television Review and Classification Board board member Milo Sogueco, and director Soxie Topacio. Additional commisioners include MOWELFUND’s Marichu Maceda, National Cinema Association of the Philippines’ Eduardo Sazon, Screenwriters Guild of the Philippines’ Dr. Isabel Sebullen, QC Press Club’s Rio Araja and Philippine Motion Picture Producers Association’s Orly Ilacad. When asked what sets QCinema apart from other film festivals, QCFDC’s Executive Director, Prof. Eduardo Lejano, answered, “Ang QCFDC gives grants. “Because MMFF [Metro Manila Film Festival] is for producers with their own budgets to produce the films. What’s unique with the festival, we give P800,000 to filmmakers and they own the rights to the films,” he added. Detailed guidelines can be obtained in the QCFDC Facebook page (http://www.facebook.com/qcfdc) where the required application form can also be downloaded. Interested parties may call at 444-7272 loc 8208 and look for Ms. Giana Barata for inquiries.